1. Preheat the oven to 200°C, gas mark 6. Heat the oil in a large frying pan and cook the courgettes, red onion, peppers and most of the basil leaves for 10 minutes until softened and lightly browned, adding the mushrooms for the last 2 minutes. 2. Stir the cherry tomatoes and sundried tomato paste into the pan and heat gently. Season. 3. Spoon one third of the vegetable mixture into the base of a heatproof baking dish (20 x 30cm is about the right size). Cover with a layer of pasta, followed by a little cheese sauce and a sprinkling of mozzarella. Repeat the layers finishing with a layer of lasagne covered with a good layer of cheese sauce and a sprinkling of mozzarella. 4. 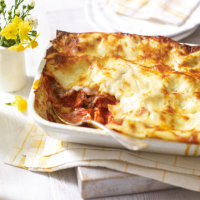 Place the lasagne dish on a baking sheet and cook for 40 - 45 minutes, covering with foil after 20 minutes once the top is crusty and golden brown. Grind over some black pepper, scatter with a few basil leaves and serve with a crisp green salad. This dish is ideal for freezing. Wrap well and freeze at the end of step 3. Thaw and continue to cook from step 4. A soft and fruity Italian red like Vignale Valpolicella, Veneto, Italy would be the perfect accompaniment for this recipe.